Celebrating an alpine winter classic, Le Pont de la Tour has launched a unique cheese room experience for January, specifically championing fondue. While arguments often take place over whether fondue’s origins lie with France or Switzerland, Le Pont de la Tour is decidedly French, opened by Sir Terence Conran at the beginning of the 1990s. D&D London has since taken over the Shad Thames restaurant. Occupying a former Victorian warehouse complex, the operation is split into two components: a lavish cocktail bar and a plush dining room with floor-to-ceiling windows overlooking the Thames and the port of Tower Bridge (the restaurant’s namesake). Here, French classics dominate the menu, studded with flourishes of refreshing modernity. Accepting reservations until Friday 25th January – with two sittings each day, at both lunch and dinner – The Cheese Room occupies a semi al fresco space at the front of the restaurant. 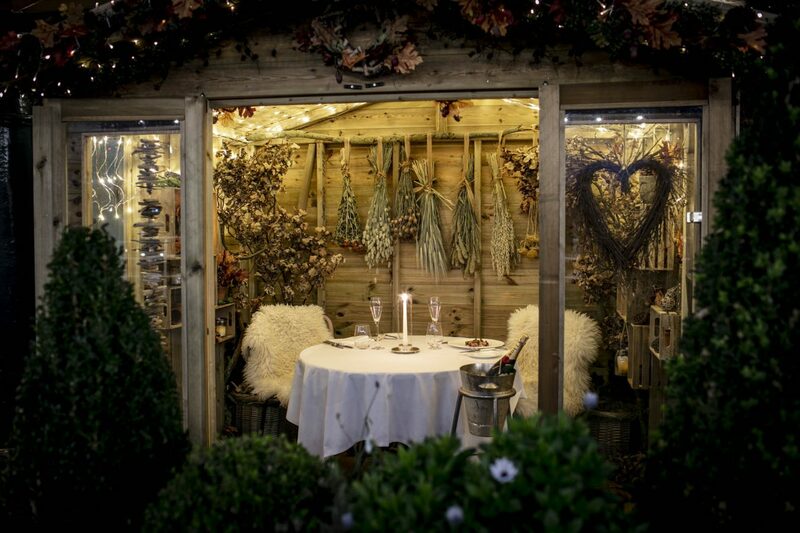 An intimate hut festooned with shaggy rugs utilised as chair cushions, hanging wreaths and pinecones ensnared within Perspex baubles, the space has one table cloaked with starchy white linen, capacious for up to four guests. A personal fondue waiter is also on hand. Priced at £50 per-person, the experience includes a welcome glass of Moët and Chandon, followed by a set menu of three courses. “We have another booking in an hour and a half, so we may need you to finish in the bar,” our waiter explains while pouring the Champagne. Starters are quick to follow. One of France’s oldest blue cheeses, Fourme d’Ambert is showcased alongside a quenelle of caramelised shallots cooked in port, harbouring a slightly acrid bitterness. An accompanying velouté of chicory, poured at the table, is silky and decadent, fortunately less bitter than expected, thus complementing the shallots. The main course of indulgent fondue soon arrives at the table, with a canister of chafing fuel slipped under the heavy caquelon. Synonymous with 1970s dinner parties, fondue takes its name from the feminine passive past participle of the French verb ‘fondre’ (meaning “to melt”), promoted as a Swiss national dish during the 1930s. The first known recipe, however, was published in a 1699 book with a title which roughly translates as “to cook cheese with wine”. Until the late 19th Century, the name ‘cheese fondue’ referred to a dish using eggs in its preparation, ultimately resembling something between scrambled eggs with cheese and a cheese soufflé. While various iterations do exist, fondue – as it is currently known – traditionally features a mix of grated cheeses (specifically gruyere) slowly cooked with white wine and a whisper of Kirsch. 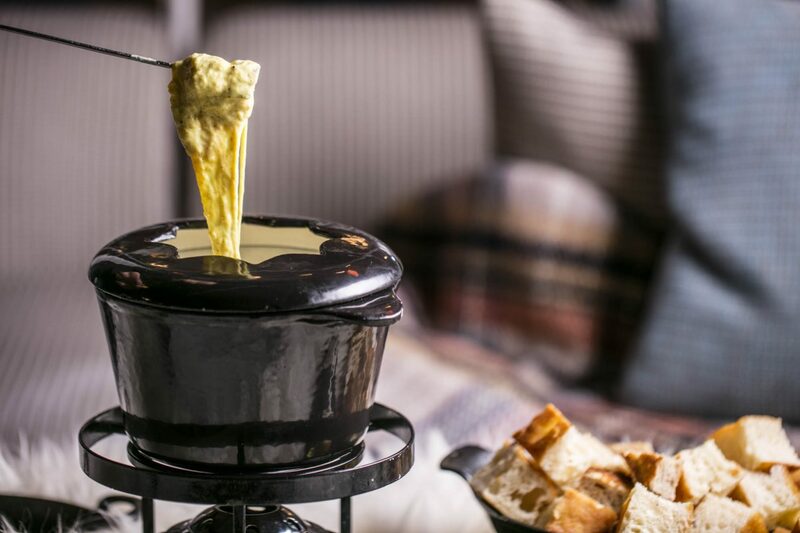 Featuring a blend of emmental and gruyere cheese loosened with white wine, Le Pont de la Tour’s fondue is superlatively prepared, customarily served with cubes of firm white bread. Roasted new potatoes are also available, as are spears of tender stem broccoli lashed with butter; or a plate of charcuterie – salami rampant with garlic, salty prosciutto, breasola and minute cornichons soaked in slightly sweet pickling liquor. The goutily indulgent dinner concludes with an exemplary chocolate fondant with a molten centre that oozes but doesn’t taste of raw cake mixture – the inherent richness slightly combatted by slivers of tart blood orange and a rocher of lively blood orange sorbet. A unique experience in the setting of one of the Southbank’s most equitably celebrated fine dining establishments. Further information on Le Pont de la Tour’s Cheese Room can be found here.